Knee Arthroscopy allows an Orthopaedic Surgeon to diagnose and treat Knee injuries by viewing "the inside of the Knee" through small incisions using a pencil-sized instrument called an Arthroscope. 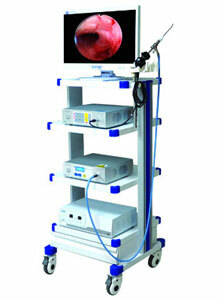 The Knee is filled with fluid and the scope transmits an image of the Knee through a camera to a television monitor. During Knee Arthroscopy Surgery, additional small incisions are created to allow insertion of other small instruments to remove or repair damaged tissues. Most Arthroscopic Knee Procedures are done on outpatient basis. Recovery is typically much quicker and easier than traditional open Knee Procedures. With improvements of arthroscopes and higher resolution cameras, the procedure has become highly effective for both, accurate diagnosis as well as proper treatment of Knee problems. 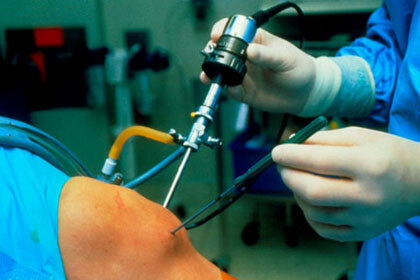 Knee Arthroscopy is used in performing a wide range of different types of surgical procedures in the Knee Joint including: confirming a diagnosis, removing loose bodies, removing or repairing a torn meniscus, reconstructing torn ligaments, repairing articular cartilage and fixing fractures of the joint surface. There are various types of Knee Prosthesis and the choice of the appropriate one is based on the condition of the Knee, Age and Lifestyle of the patient. 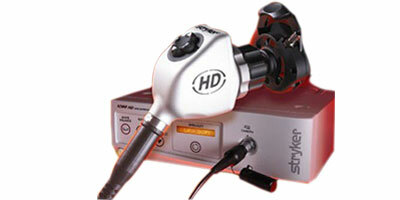 The image by an Arthroscope is magnified and allows the surgeon to see better and clearer. The Arthroscope allows the Arthroscopic Surgeon to see and perform Surgery using much smaller incisions. This results in less tissue damage to normal tissue and can shorten the healing process. 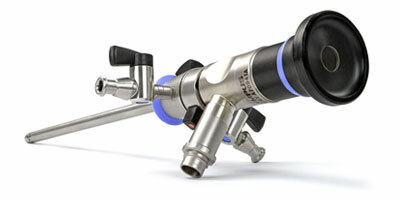 An Arthroscope is a cylinder with a lens at each end. 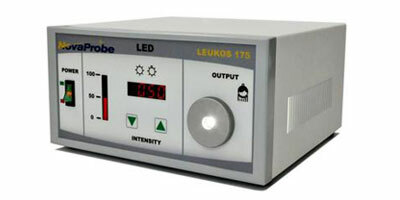 A light source is attached to the Arthroscope by a Fiber Optic Cable. The light is shone down the Arthroscope in the same direction as the surgeon is viewing in order to illuminate the interior of the joint. The Arthroscope is locked in the camera which is attached to the console.The buttons on the camera can adjust the amount of light. The console in turn is connected to a TV and recorder. The TV will display everything visualized in the joint, and the recorder will record these videos in DVD format. 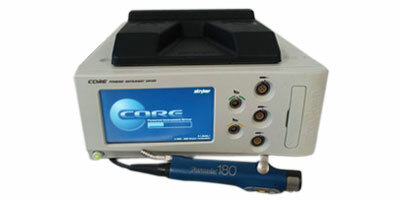 The Fiber Optic Cable connects the Arthroscope to the light source for illumination in the joint. these cables are Water tight for easy cleaning, and soaking in sterilizing solutions. This is a power device which helps to shave the meniscus, cartilage flaps and fat pad. The TV, recorder, camera console, light source and shaver console are placed on a trolley close to the operating table. Arthroscopy is a day care procedure where in the patient is admitted in the hospital on same day in the morning and is discharged on the same day in the evening. As there is very little interference with body systems as well as the joint tissues the patient not only goes home the same day but is also able to start regaining body functions by same evening or max by next day morning and are able to get back to work in few days.